Rhythm ribbons: doesn’t that just sound fun? They are! My daughter loves to jump/run/dance around the room with her ribbon in hand to just about any kind of music. The concept is quite simple: move the ribbon to the music. This is great because it doesn’t take any kind of musical genius or even rhythm to have success with rhythm ribbons. It’s a chance to connect body movement with the music. Watch for the crawler at the end who makes a dash for an abandoned ribbon. So cute! Music in the video is At the Bottom of the Sea on For the Kids Too! I know you’re just jumping at the chance to put rhythm ribbons to work in your playtime so here are some resources to get you going. First, you need the ribbons. This project was so incredibly easy to make. In fact, I was able to make them while my toddler crawled all over me trying to get a better look and help any way she could. Second, you need to choose some magical music to get the party started! Directions: Cut ribbon into 3 1/2 foot (42 inches) lengths; Apply glue to one craft stick; Smear glue from first stick onto another craft stick; Place one end of the ribbon on the stick about 1 – 1 1/2 inches. Place the other craft stick (glue side down) on top of the craft stick with the ribbon; Press sticks firmly together; Place on wax paper, cover with wax paper and place a heavy book on top while glue dries. Once the glue dries, your rhythm ribbons are ready to use! Sammi danced around the table asking if they were dry yet for about 10 minutes. (I was very impressed with her attention span for waiting for the ribbons!) Finally I gave in and checked and they were dry! We turned on some music and started spinning, zigzagging and waving our ribbons around the room. Check out more Twinkle Twinkle Little Star Crafts in this post! Songs with actions are great! But what do you do with a great song that doesn’t really have any actions? 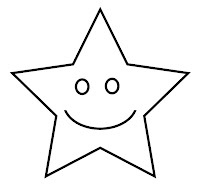 For Twinkle Twinkle Little Star it’s fun to open and close your hands like a blinking star, but it’s almost too repetitive, even for the most pattern-loving children. Sammi went through a period of time where she didn’t want to sing this song, even though it was her very most favorite, because she didn’t get to do anything during the song. One day we cut out stars, colored them and glued them to a craft stick. Instant success. She loves to hold her star and move it around while we sing Twinkle Twinkle Little Star. We’ve since discovered several objects in our home that have a star. Sammi bursts into song pretty much any time she finds one such object. It’s good to have her back!